It’s a critical question that Guy asks Girl in “Once,” the Tony Award winning musical that makes a stop in San Jose through Sunday, April 26th. And it’s a question at the heart of this scintillating production, a question that must be answered in order for Guy to continue digging out of the sad life he’s created for himself. The question is answered, but in a language Guy doesn’t understand. And that is where the heartbreak lies. Guy’s life is going nowhere fast. He is a “busker,” Irish for a street musician, collecting coins for every note he pours out of his pained soul. He is certainly a talented singer, guitarist and songwriter, but spends more time fixing broken down Hoovers for his dad’s business than breaking down chords for himself. “Once” is based on the 2007 film of the same name, with a book full of discovery penned by Enda Walsh and wonderful compositions by Glen Hansard and Marketa Irglova, who starred in the film. It cleaned house at the 2012 Tony Awards, nabbing eight in total, including awards for best director, best actor and best play. While Guy sings his latest love ballad in an Irish pub, Girl listens intently. She is curious, asking questions about the inspiration for this compelling tune. It’s a difficult inspiration, fueled by the memory of his jilted lover, now in New York City. For Guy, it’s time to move on from these devastation-inspired songs. This is not good enough for Girl. She wants more of him, but he adamantly refuses. Yet as he leaves the bar, a song he is working on falls out of his jacket pocket. She snags it, and after more tugging, proceeds to sing with him while playing the piano, the two of them connecting deeply with majestic harmonies that make goose bumps flutter on the listener. Slowly but surely, magic pours out of them. Out of their hearts, through their fingertips, and slowly, into each other. Guy is certainly compelled by this lovely young Czechoslovakian girl, who is quick to pay for her own vacuum repair with the compositions of Mendelssohn as currency. What follows is a beautifully paced, heart-tugging story of love and music, and explores what inspires the songs that begin inside our hearts and finishes with how they are placed in others. The production features so much that follows a simplistic formula. 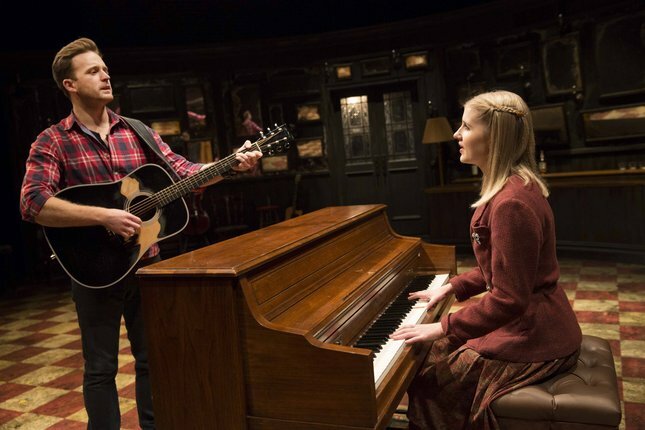 In “Once,” the emphasis is purely on and connecting the audience to the story, quite literally in a few instances. 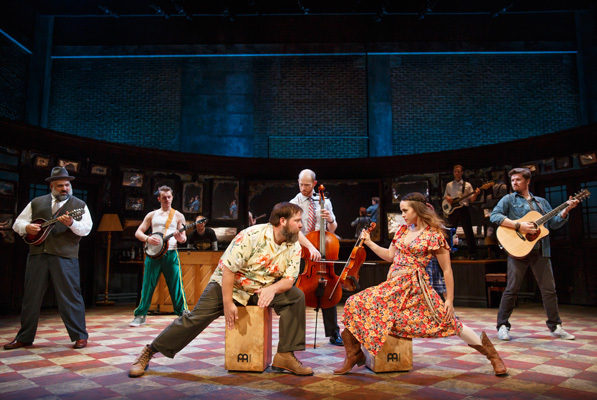 Cast members invite the audience up on stage before the show and during intermission to have a drink at the on-set bar and participate in a jam session. There is nothing fancy in this production, just pure purity. The 12-person cast acts as the ensemble, various friends and family members, and the orchestra, contributing music blatantly in some numbers and subtly in others. The scenic design by Bob Crowley is big on metaphor, the constant reflection of the characters reflected by the mirrors that hang all over the walls in a charming, rustic Irish pub. The direction of John Tiffany and the movement Steven Hoggett are also reflective of the beautiful harmony that exists within the music. What really puts the show in the elite stratosphere is the way it moves through space. Transitioning from scene to scene is an exercise in precision, with deft Brechtian touches throughout the staging. Each location is simply stated, with just hints of where things are taking place. The cast stays on stage virtually the entire time, never really exiting, but just moving towards stage right or stage left to leave the scene. The handsome Stuart Ward’s brooding take on “Guy” was balanced beautifully with the exquisite Dani de Wall, whose “Girl” helps his deep compositions soar. Beautiful numbers such as the signature one, “Falling Slowly,” are wonderfully discovered. Girl’s number “The Hill” takes on a hauntingly gentle and poignant quality. Music and Lyrics by Glen Hansard and Marketa Irglova. The Word: A beautiful love story that is unlike any other love story. A wonderful experience all the way around, with fabulous touches informed by the musical culture of Ireland.